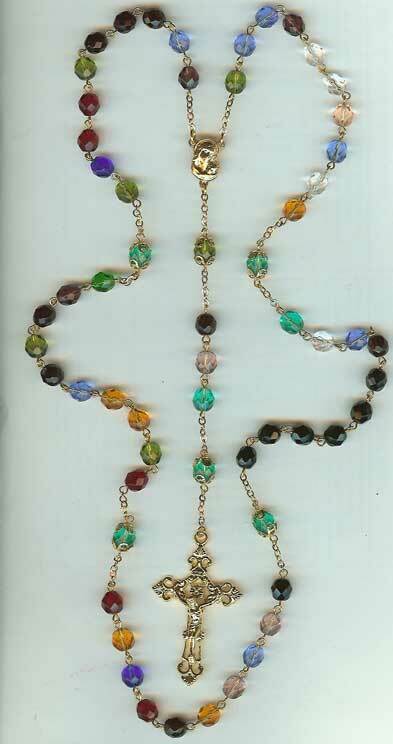 This Rosary was made for a 50 Year Wedding Anniversary gift for a Mom. Her birthstone is March. Traditionally black beads are use for religious rosaries. I have chosen in this design of multicolor to use the black beads to show where the fourteen children's birthstones leave off and the twenty-nine grandchildren's birthstones begin. Unless otherwise stated the Mom's birthstone, which is Aquamarine, will be used for the Our Father Beads.